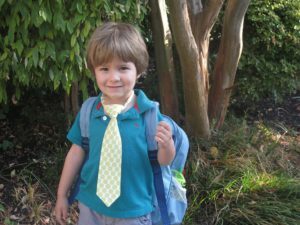 For parents of kids with Autism, the end of summer blues come with a lot of anxiety…how is my child going to transition to a new classroom this year? Will it be as bad as last year? Is there anything I can do to make this easier for my child? Spending some time helping your child prepare for this transition will not only help them but parents too! Here is a list of several things parents can begin to do to help that transition occur more smoothly. Visit the school ground, play on the equipment. Visit the new classroom; meet the new teacher if that is a possibility. Take some photos of your child playing on the playground or meeting the teacher and review these with your child periodically. Make a list of the school supplies your child will need, if possible have them join you in making this list. Shop for the school supplies together, allow your child to choose their favorite pencils, crayons, erasers, themed notebooks, etc. Review your child’s previous years IEP to make sure that you are in agreement with the goals for your child for the upcoming year. If you have deviated from the school year bed time routine, now is the time to get back to the routine of putting your child to bed earlier AND waking at the time necessary to get ready for school once it starts so the morning routine will be easier. I know this is hard, but you will be happy you did so! Re-establish routines of getting dressed and out the door in the morning to help transition into the school day rhythm – maybe you will run errands or go to the park (until school begins). Start eating meals at the same time that they will eat during the school year. Begin to have your child help you prepare lunches and snacks. This will increase their memories of competency and enjoyable shared experiences. It will also serve as an positive anchor for them when they eat their lunch at school. If your child hasn’t read all summer, now is a good time to crack open a book and have them start reading, or read to them. Help your child take responsibility for the kinds of things (consistent with their age) that they will need to do at school. Writing name, tying shoes, organizing school materials and back packs. Request a meeting with the teacher the week before school so you can sit down and discuss your child. Bring an “All About Me” written portrait of your child to share with the school staff. This helps the staff bridge their learning about your child and also sets the stage that you are an active, involved, committed parent. Be sure to share anything that will be helpful for the teacher to understand including supports that you know help him/her, strengths, weak areas, likes, dislikes and communication style. Parents often find that by going through this process it helps them organize their knowledge and concern about their children and advocate for them more effectively. Stay tuned for Part 2 – back to school strategies where I will discuss how to write an informative portrait of your child and advocate more effectively. Interested in RDI online parent training? Go here to get more information.